Friday I returned from Laure Ferlita’s artist’s beach holiday, Winter Interrupted. Along with a suitcase full of dirty laundry and sand in my shoes, I came home with new friends, new sketches and great memories. Eight of us spent four days sharpening our sketching-on-location skills at various places in the St. Petersburg, FL, area. Each day we had a new destination: John’s Pass, Clearwater Marine Aquarium, the beach itself, and Sunken Gardens. Laure offered instruction and demos, then turned us loose to sketch. Most of us had never met in person, but had taken online classes together and/or connected through our private class blog. It didn’t take us long to bond, and we ended up spending a good deal of our free time together, too. Sharing benefits everyone. One of my favorite things was when we shared our sketchbooks after each session. Each person’s take was different—even when two people sketched the same thing, the results were different—the hand of the artist in action. One day we also shared all the items in our sketching kits—so much fun to see each person’s favorite pencil/pen/sketchbook/palette, and we all jotted down tools we want to get our hands on. “Bad sketching days” happen. I had one when I felt overwhelmed and just “off.” I didn’t like any of my sketches, but I made myself sketch anyway. The next day was better, and I can always go back and sketch from photos if I want a better representation of what we saw that day. 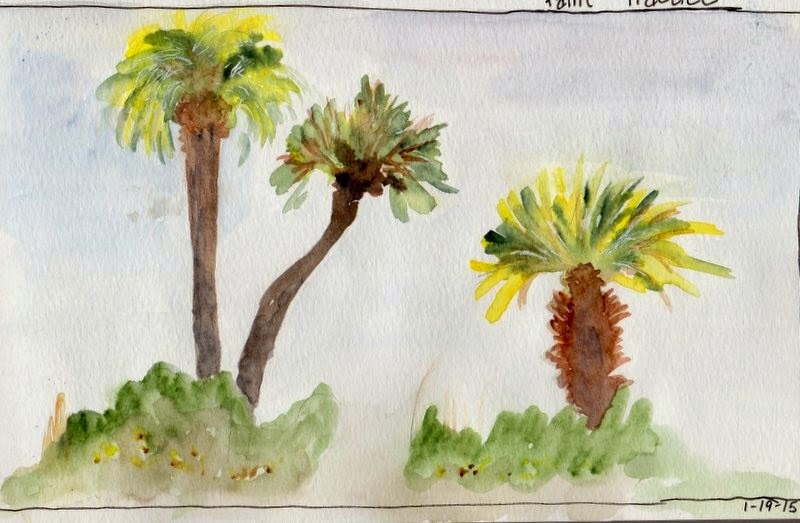 I love sketching palm trees! I added them to several pages, even when they weren’t part of the lesson. I’m still working on my pages—and will be for a while—so I can draw out the pleasure of the experience. I’m grateful to have had the chance to escape my everyday routine and add some art adventure to my life! When was your last getaway? Are you planning one soon? Love the palm trees! Nice to see your work. Yeah, I kinda wish the same. Me too! Thanks to you too Kathy. Thanks, Laure, and you're welcome Cheryl! We'll just have to do this again soon. Oh Kathy, how wonderfully nourishing, your artistic retreat!! Your palm trees look so alive & lively. I guess accepting "bad sketching days" is as important as enjoying the good ones! I haven't been away in awhile & will have to think about that. Rita--it was a great retreat, and I came back recharged. Hope you get the chance to recharge, too, whether or not you go away somewhere to do it. Oh Kathy - what a wonderful experience - so glad you got to go. I am sure you made memories that will last a life time too. Thanks for sharing your photos and I love your sketch in ink. Take care. Debbie: Thank you. It was wonderful. The whole group bonded almost immediately, and we feel like we got so much more than art instruction! Kathy, would you mind if I use your sunken garden photo as a reference for a sketch in my book? Yes, we did bond almost immediately. It was one of the highlights of my life. One of those things I have fantasized about for years and the dream was truly made Real! Clare--Yes, please feel free to use my photo. I'm so glad you felt as I did that we all bonded so quickly. Hope you're staying warm! Claire--It was so wonderful, wasn't it? Glad you were able to share with your mom, too.